I did a search on Google for images and a search for quotes concerning “temperance.” Amazingly, almost everything had to do with not drinking alcohol, and dated back to the Prohibition era. There were precious few things of a modern bent, and none that I could use. Is temperance a thing of the past? Why in the world would Peter mention that we are to add "not drinking alcohol" to our faith, virtue and knowledge? Some are already thinking this is an article about proving that it is okay to consume alcoholic beverages. As close to the truth as I can possibly get. It is a shame that the word 'temperance' only brings up such a distortedly contorted image, for the word itself has a much nobler meaning. The origin of temperance, of course, is from the Middle English via the Latin. from kratos, "strength," occurs in Act 24:25; Gal 5:23; 2Pe 1:6(twice), in all of which it is rendered "temperance;" the RV marg., "self-control" is the preferable rendering, as "temperance" is now limited to one form of self-control; (emphasis added) the various powers bestowed by God upon man are capable of abuse; the right use demands the controlling power of the will under the operation of the Spirit of God; in Act 24:25 the word follows "righteousness," which represents God's claims, self-control being man's response thereto; in 2Pe 1:6, it follows "knowledge," suggesting that what is learned requires to be put into practice. Almost all other translations render the word as "self-control." Now, I understand that this next thought will probably mess with your mind, but try this on for size: the exact same word with the exact same meaning is listed with the fruit of the spirit in Gal. 5:23. Most believers I have encountered refer to the fruit of the spirit as something that happens to them. You know—fruit grows as a result; you don't make it happen. And somehow, that thinking absolves them of all responsibility. However, one cannot get away from the idea that the fruit listed is one of self-control. You control yourself. Nobody else will do it for you—not even the Holy Spirit. 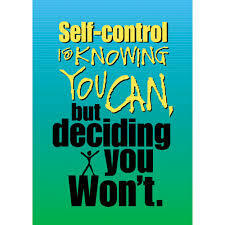 What areas of our life should we exercise self-control? Well, what areas get us into trouble? As you can see from just this short list, the possibilities of making this into a seriously long article, or the beginning of a series of articles, are quite real. I'm sure your mind is already at work on this. I will try to refrain, however. Using Ben Franklin's method, as mentioned previously, for developing virtues, you could spend quite some time on this one virtue in each one of these areas. Let's look at these briefly. Do you exercise control over your resources? Your money? Your assets? What happens when you have an unexpected "windfall?" Is a spending spree on the horizon? Do you use your money wisely? What kind of food do you buy? Is it good for you as the temple of God? When you buy a car, is it style or function that you go for? Do you stretch to the absolute limit of what you can afford on a monthly payment? Do you buy the best tools you can afford, but insist that your spouse not "spend so much money" on their tools? What is your savings plan? When was the last time you put money into it? What is the date set that you will be debt free? What is your giving plan? Is it in place and active NOW? You may not have complete control over every aspect of your environment, but any area that causes you problems with your self-control needs to be controlled. Paul gives this indication in Romans 13:14, telling us to "make no provision for the flesh..."
What kind of music do you listen to? How loudly do you play it? What kind of programming do you watch? How much time do you spend watching TV? Do you allow those in your household—yourself, spouse, children—to leave things wherever they happen to finish with them? Are things scattered around the room? Do the dishes pile up until you are forced to wash them just to have something clean from which to eat? Are your clothes neat and clean? How well do you control the time allotted you? Do you have a plan for each day? Is that plan written down? Why are we told to "redeem the time" in Ephesians 5:16? Redeem means to "buy back." From whom must you buy back your time? Who is it that has your life planned with distractions, interruptions, wasted moments? Controlling one's thoughts seems like a pipe dream to many, but is a necessary skill if we desire mastery in this region of self-control. One of the best methods for achieving this type of self-control is to orchestrate a change in mindset, to which we have alluded previously. What kinds of thoughts appear consistently for you? Are they negative? Judgmental? Critical? Lustful? Could this possibly reveal your mindset? We are given the tool for controlling our thoughts in Phil. 4:8. Use it. I should probably leave this one alone, because we all know it is our individual nemesis for just about everything. But, the Bible is filled with admonitions about the destructiveness of this little member of the body. What do you talk about? People? Politics? Celebrities? Neighbors? Sports? How much control do you exercise over your speech? Do you ever choose to NOT say what comes into your mind? Do you interrupt? Do you go on and on and on without giving another the opportunity to interject a thought into the conversation? The walls of a city were used to protect it from invaders. When the walls were broken down, invasion from without was guaranteed. Without gaining rule over your own spirit—self-control—you are open for whatever invasion the devil decides you need. Peter tells us that we are to add self-control to our faith, because faith alone will not be enough to grant you smooth sailing in this life.